Finally, are you ready to be the Ultimate professional bartender and work private events in someone ELSE’s home or convention center for weddings, fundraiser, house parties, or major events? If you’re serious about getting a job in the bartending industry, especially events that pay out $25 per hour plus tips, this is the most complete bartender training package available. The Ultimate Professional is designed for those who wish to gain employment in the bar industry along with the freedom to come back anytime and to work as an INDEPENDENT, boss free bartender! Pick what you want according to seat availability and date. Then, simply call now to enroll before someone else takes your spot and opportunity away from you! Seats are limited weekly, so time is of the essence. Although you probably should have done this yesterday, there is no better time to enroll than right this moment!! Choose your option and call now! Professional bartenders, managers, owners, and our students come to Raleigh Bartending School and Charlotte Bartender School for the hands-on bartending training as well as to learn the legal aspects of serving alcohol. It is now required in many states, that a professional bartender must be certified in order to serve alcohol. 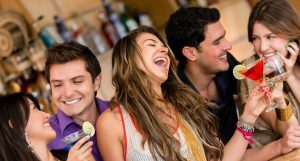 Our Bartender Schools cover this area of Bartending extensively as well as Flair Bartending, proven methods of increasing your tips and how to land the Bartending Job you want.